Antonio Bianco MD PhD is interested in understanding the aspects of thyroid hormone action that involve the deiodinases D1, D2 and D3. The BiancoLab at University of Chicago investigates the physiological roles played by these enzymes and their involvement in disease mechanisms. Knowledge obtained from these studies will help develop therapies that preserve thyroid hormone homeostasis in patients with hypothyroidism. The ATA handbook to investigate thyroid hormone economy and action. Sponsored clinical guidelines on diagnosis and treatment of hypothyroidism. Objective: To investigate how long-term treatment with dexamethasone affects energy expenditure and adiposity in mice and whether this is influenced by feeding on a high fat diet (HFD). Design and Methods: Mice were placed on a HFD for 2 weeks and started on dexamethasone at 5mg/kg every other day during the next 7 weeks. Results: Treatment with dexamethasone increased body fat, an effect that was more pronounced in the animals kept on HFD; dexamethasone treatment also worsened liver steatosis caused by the HFD. 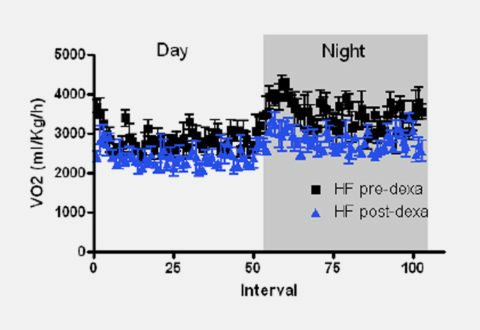 At the same time, treatment with dexamethasone lowered the RQ in chow-fed animals and slowed nightly metabolic rate in the animals kept on HFD. In addition, the acute VO2 acceleration in response to β3 adrenergic-stimulation was significantly limited in the dexamethasone-treated animals, as a result of marked decrease in UCP-1 mRNA observed in the BAT of these animals. Conclusions: Long-term treatment with dexamethasone in a mouse model of diet-induced obesity decreases BAT thermogenesis and exaggerates adiposity and liver steatosis. Dexamethasone reduces energy expenditure and increases susceptibility to diet-induced obesity in mice. Poggioli R, Ueta CB, E Drigo RA, Castillo M, Fonseca TL, Bianco AC. Obesity (Silver Spring). September, 2013. PMID: 23408649. The thyroid axis is wired to preserve and defend circulating T3. Local thyroid hormone activation plays critical metabolic role. Type 2 deiodinase (D2) is inactivated by ubiquitination. Nutrient availability and thyroid hormone activation.